Movement is the beginning of life in the natural and human world. For millennia, since pre-historic times, man has endeavored to capture this awareness of movement in line and colour, day, stone and metal. Over a period of many centuries in all parts of India, there has been an overwhelming preoccupation with arrested movement. The dancer tries to achieve a still sculptural pose, seemingly frozen while the sculptor arrests the dynamics of kinetics and yet the sculptural figure appears as if it will move any moment and fly out of the stone. With lucid style and stunning precision, this enticing monograph embodies the residual essence of fundamental research, couched in a flowing, communicative language for the lay reader. The monograph provides a glimpse into this vast canvas of the Indian sculptural and pictorial traditions. Kapila Vatsyayan, internationally acclaimed for her inter disciplinary research of fundamental importance is the author of over a dozen books, on different facets of the artistic traditions of India and Asia. Amongst these works, Indian Classical Dances has served as a bible for four generations of performers, so has Traditional Indian Theatre: Multiple Stream, which has been translated into several Indian languages and serves as a fundamental text for students of Indian theatre in many parts of the world. Other works comprise books which are the result of in depth research of primary material from textual and visual sources. Her writings are considered as invaluable milestones. Widely travelled and as frequently honoured by universities in India and abroad, Kapila Vatsyayan is the former Secretary of the Department of Arts, Government of India, member of the Executive Board of UNESCO and chairperson of the HC-Asian Project, India International Centre. For the past fifty years I have been writing on classical Indian dance, theatre, architecture, sculpture and painting in relation to literature and textual sources for scholars, researchers and academicians. Writing a small book of nearly 20,000 words for general readers on traditional Indian sculpture and painting was a challenge of a different kind. I have tried to cover the vast expanse from pre-historic rock paintings, Mohenjodaro to the 13th century. The artists have hewn a variety of stones rocks, they have moulded metal and clay, they have painted walls and ceilings of temples, caves and palaces. Archaeological discoveries, belonging to each of the epochs, exemplify the processes of artistic interaction amongst the craftsmen - both indigenous and those who came from far off lands. Resultantly, a variety of styles and genres within the larger rubric is seen. Movement is inherent in all organic life-plants, aquatic and animal life and, of course, humans. Movement has an inbuilt potential for both symmetry and asymmetry. Deer and antelopes run and leap into the air and create an extraordinary impression of dynamic movement. The rock-shelters have engravings and paintings in monochrome or polychrome. These are a visual feast due to their extraordinary capacity to capture movement. A panorama of people running and jumping, singly or together, unfolds before us an overwhelming sense of joy and playfulness captured successfully through a minimal use of line and colour. I have chosen the theme of dance. The form and movement of dance is a perennial inspiration for those who create images. Underlying the celebration of dance is a distinct Indian attitude to the body and the sense. The relationship of the body, mind and soul is articulated in ancient Indian texts, and is depicted in lines, forms, colours and compositions in sculpture and paintings. There is an abundance of evidence of in Indian miniature painting such as Jain, Mughal and pahadi paintings. I could not have done proper justice to this form even if I devoted a separate section to it. Hopefully, another book will follow on the subject for the lay reader. I would be happy if this book sensitizes the lay reader to a very distinctive feature of Indian art. The pre-historic art of India captures man's first awareness of his corporeal frame in a moment of dynamic movement. The surfaces of rock caves are covered with men and women-running, jumping, skipping, dancing with interlocked hands in rows. Occasionally there is a single dancer accompanied by musicians. This preoccupation with dance is discernible in several types of tribal and rural art in India. The wall paintings and the Saoras are outstanding examples of these incredible continuities with the distant past. Dance continues to be integral to all annual festivals and life-cycle ceremonies in India even at urban levels. The forms of music and dance are innumerable and the levels of sophistication many. India, home to one of the most ancient civilizations, is a unique example of cultural and geographical diversities. Dissimilar cultural practices are deeply rooted in people's daily lives even in the 21st century. Indian history is the fruit of geography, and geography the root of history. The history of several millennia has merged with phenomenal geographical variations to create the incredible India of today. India is incredible in its landscapes, and the people who adorn her. Its rituals and traditions; sculptures and paintings; dance, music and theatre; handicrafts, fairs and festivals,; monuments and manuscripts; and its varied cuisine-each are a definite statement that only India can proudly pronounce. Myriad streams and rivers have been flowing for centuries in their own special terrain, sometimes forceful, sometimes gentle. Despite all kinds of obstacles, they flow on. When these waters reach the ocean, they mingle, and become one huge ocean. Similarly, these diverse, astonishingly rich and colourful cultural currents crate a harmonious hymn known as India, even as they retain their unique individual identify. This series of Incredible India presents 10 books on different cultural aspects of the country, written by well-known experts of the subject. This book by Dr. Kapila Vatsyayan, doyen of Indian culture narrates the history of traditional Indian sculpture and painting. The author has chosen the theme of dance as depicted in these visual art forms. Her journey begins from the small sculpture of a dancing girl from Mohenjodaro, and the broken torso from Harappa, perhaps a remote first prototype of Shiva as Nataraja. 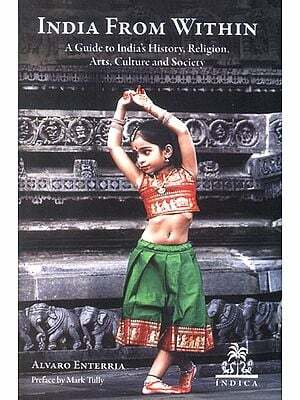 According to the author, the artistic evidence in India explicitly demonstrates the antiquity and continuity of the centrality of dance in Indian culture. She takes the reader to temples and caves, to excavation sites and to the monuments on the mountains and seashores, through the breadth and length of the vast and variegated land of incredible India. Her detailed descriptions of the frozen movements unfold the past before the eyes of the reader, as if they come alive and dance once again! The wall paintings from Bhimbetka, the wall and ceiling paintings in the caves of Bagh and Ajanta are priceless treasures of Indian paintings. The author has consciously avoided lengthy discussion on miniature paintings, as the subject is too vast for its inclusion here. This book, therefore, is only a peep into the expansive world of Indian sculpture and painting through the depiction of dance, the arrested movements.